We employ a team of skilled and certified tail lift fitters to ensure your lift is fitted and load capacity tested as per the tail lift manufacturers instruction. We can fit, commission and weight test column, cantilever, tuckaway and retractable lifts ranging from 500kg capacity to 8000kg capacity. We operate an ‘all makes’ policy where customers have the right to specify their chosen model and lift manufacturer. Column lifts are body mounted and the most popular choice for multi drop distribution vehicles as these offer the shortest operational cycle times with a manually opened and closed ‘flat’ platform. The platform runs vertically in a rear body mounted ‘H’ frame via a chain linked to hydraulic power pack. Rear Frame Column lifts have been around for some time but have increased in popularity over the last few years. 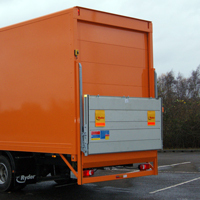 Once a relatively expensive alternative to the standard column tail lift this type of lift offers maximum rear aperture height and width without the need for a rear shutter. 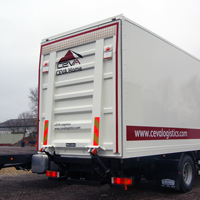 The rear frame lift incorporates the body rear frame and a hinged top flap above the load platform which gives a slight payload advantage over the standard shutter and tail lift combination. Three models are now available, the Dhollandia VOCS, DEL FC500 and the Palfinger RQR all of a very similar concept and design. 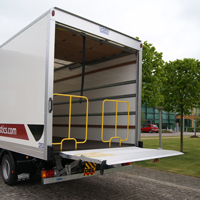 Tuckaway lifts are chassis mounted lifts popular where tail lift loading may not always be required giving quicker access to the rear closure, many parcel delivery companies choose tuckaway tail lifts for their versatility. 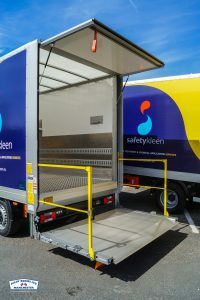 They also prove advantageous for loading dock and rear fork load operations where a column lift or cantilever would restrict access and as the lift is mounted under the rear of the body this can help prevent potential damage. Cantilever lifts are chassis mounted and mainly used for items with a large load footprint where loading would be unsafe on a smaller column lift. The operational cycle time is somewhat slower however cantilever lifts are fully hydraulic ram operated and can offer greater lifting capacities than column lifts. Cantilevers can also form the body rear closure often saving the weight and maintenance costs of a rear shutter. Retractable lifts are chassis mounted lifts that offer a level flat platform which can be essential for trolleys and wheeled goods and similar to the tuckaway they are best suited for loading dock operations. Retractable lifts can offer greater capacity and large platforms but require large chassis rear overhangs and are more common on our tuffloader range of bodywork.